Cristina G. Reynaga-Peña is an Education Researcher at the Centro de Investigación y de Estudios Avanzados del IPN (CINVESTAV) Unidad Monterrey, in Apodaca, NL, México. Images in science are not simple perceptual entities but carry a great deal of conceptual, abstract, and often mathematical content. A mental image is more like a mental model or a scheme depicting visual, spatial, temporal, causal, and other types of information (Ramadas, 2009). The human sense of touch is an active, informative, and useful perceptual system (Klatzky & Lederman, 2002). Active touch is considered “a complex modality that extracts and encodes a wealth of information from cutaneous and kinesthetic receptors” (Ballesteros, 2008); using active touch in haptic perception is very efficient in object recognition (Klatzy, Lederman, & Metzger, 1985). Research has revealed that one can generate an image without using visual aids, mainly through touch, suggesting that visualization processes can be enhanced by adding or replacing visual information with other sensory modalities (Reiner, 2008). Acquisition of mental models is the basis for meaningful learning (Gentner & Steven, 1983). In their study to investigate what learners need to construct mental models of systems, Chan and Black (2006) found that incorporating the haptic channel (direct manipulation-animation) in the science learning process provides students with proper learning experiences to reason about causal interactions and functional relationships in systems, thus facilitating their acquisition of mental models. Most studies in this respect, however, deal with haptic/kinesthetic elements in combination with visual clues and much less research exists on the use of haptics alone. In the field of chemistry teaching, ball and stick models of chemical molecular structures have long been available and studied with regard to their role in learning, proving that manipulation of physical or virtual three-dimensional models helps students construct a more concrete understanding of chemistry concepts (Copolo & Hounshell, 1995; Gabel & Sherwood, 1980; Wu & Shah, 2004). Meanwhile, biology teachers and other educators are increasingly using information and communication technologies to supplement their instruction in regular classrooms, and multiple representations (i.e. verbal, mathematical, visual, or real-life observations) have long been used to teach biology (Treagust, 2007). Nevertheless, teaching the subject matter still relies heavily on the use of vision (e.g. images, videos, and visual observation) and there is a significant limitation on the use and availability of non-visual methods and resources for teaching biology. Then, what is currently available for teaching science for students without sight? In most cases, instructional visual resources, such as images, drawings, and diagrams, are substituted by tactile graphics and three-dimensional models. The most common resources specially designed for blind and visually impaired students are tactile diagrams and graphics printed in thermoformed vinyl, which are made according to specific tactile graphics standards (Braille Authority for North America, 2010). These materials are widely found in all specialized suppliers. Although thermoformed graphic materials are inexpensive and easy to obtain/manufacture, they are, by nature, two-dimensional representations of objects that can compromise object understanding. Early studies comparing tactile recognition of 3D representations and 2D raised-line drawings of common objects by congenitally blind subjects (Klatzy et al., 1985; Lederman, Klatzy, Chataway, & Summers, 1990) suggest that 2D pictures are extremely difficult to identify by touch, as the two-dimensional recognition rate is very low in comparison to almost 100% recognition rate for 3D objects. Recently, Thuerel, Witt, Claudet, Hatwell and Gentaz (2013) demonstrated that the use of texture in two-dimensional pictures improves recognition rates by young blind children. These studies support the common and long-term practice of most special education schools, where parents participate in making textured home-made representations of objects or images to support their children’s education. On another side, commercial three-dimensional representations are available from different sources. But most of them are not specially designed for the blind such as in the case of anatomic models of the human body, earth globes, models of DNA structure, ordinary animals, and others. In those cases, tactile characteristics such as texture and materials used for manufacture are frequently not optimal for easy tactile resolution, even for those available at specialized suppliers. Descriptions of curricular adaptations on science teaching for visually impaired learners are scarce and mostly outdated (Linn, 1972; Malone & De Lucchi, 1979; Miner, Nieman, Swanson, & Wood, 2001; Norman, Causeau, & Stephanich, 1998; Stephanich, 2001; Thier, 1971), particularly in México, where these types of resources are practically nonexistent. For effectively teaching in the inclusive classroom, it is sensible to consider the multisensory learning method proposed by Montessori (1912) which uses a mixture of visual, auditory, tactile, and kinesthetic approaches. Using all available senses for teaching science to blind students is proposed by Soler-Martí (1999) on the premise that the use of all senses allows for the capture of valuable information in the first step of the scientific method: the observation. Research has shown that the use of multiple senses for learning is involved in the development of general cognitive processes, from concrete thinking to abstract thinking (Loucks-Horsley et al., 1990), which is an essential part of science learning. Our work originated from the need to create a methodology that helps visually impaired and blind students learn biology. We decided that this could be achieved through the design and production of adequate and engaging tactile representations, accompanied by curriculum activities for teaching/learning biology in inclusive formal and informal settings. We aimed for blind and visually impaired children to have similar opportunities for learning as their sighted peers, by sharing the same materials and performing the same activities. Because our original target population was elementary school students, we initially decided to focus on three-dimensional representations, rather than two-dimensional tactile graphics of other sorts, to avoid requiring the additional skills necessary for graphic interpretation by young learners. Thus, this paper describes the creation of tactile three-dimensional models and the development of an inclusive, multisensory curriculum to effectively support teaching of biology topics, making microscopic subjects accessible for both visually impaired and sighted students at the elementary and middle school levels. The process of creating tactile three-dimensional representations (i.e. models) for teaching science was an endeavor that initially involved the active participation of college art and graphic design students from various universities in México. Models were created, within possible means, under Universal Design for Learning (UDL) principles in such a way that the three-dimensional models carry overall physical features with strong visual as well as tactile features, making it possible for work simultaneously by groups of diverse learners. As the project evolved, we generated a protocol of meticulous steps that included: a) selection of the biology subject on which the model would be built; b) insightful design focused on the physical features to be highlighted for teaching the subject matter; c) selection of building materials with adequate characteristics to provide accurate tactile information – but also including visual features attractive to sighted learners; d) building the model; e) revision for scientific accuracy; f) revision by educators of the blind (special education teachers mainly); g) pilot testing with blind, visually impaired, and sighted users; and, if necessary, h) adjustment to the design before producing the final piece(s). In all stages of the project, models were evaluated by a team of volunteers and colleagues who are experts in each area implicated for obtaining the best possible tactile representations: scientists, plastic and visual arts professionals, pedagogy specialists, and educators of visually impaired students or the students themselves. Models have been made in a variety of materials, including fabric, paper, latex, silicon, resins, polymer clay, wood, ceramics, and general craft supplies. These materials were used in order to produce different textures to identify different structural elements and actual characteristics of the object represented. It is fair to say that each model produced to date is a unique piece, custom made (by principle). Some were not necessarily designed for heavy use. Instead, with distinctive and special characteristics, they were designed to serve as valuable teaching materials, which in addition had to be attractive enough to engage learners to build their knowledge through exploration and manipulation with their available senses. In an advanced phase of the project, and with the aim of facilitating the student’s conceptual understanding of selected biology topics, some models were precisely designed and built to be used as a set in a structured sequential order that allowed covering complete topics in detail, making them potentially useful for middle- or high school-level instruction. Since most topics we have approached so far deal with the biology of plants and fungi, organisms widely used for human consumption on an everyday basis, it was feasible to take advantage of the multi-sensorial method described by Soler-Martí (1999) for developing a comprehensive curriculum. Within such context, recommended activities involve exploring by touch as a primary modality for learning, strongly proposing the offering of comprehensive and complete descriptions according to the education level of the learner, and suggesting optional activities for the smell and taste of common representative food samples and products related to each biology topic (when suitable, safe, and desirable). In all curriculum topics we aimed to use household and easy to obtain materials. A key aspect of our curriculum is to relate scientific concepts with everyday activities in order to attain meaningful learning. Most models produced to date are three-dimensional representations suitable for haptic perception which cover biology concepts focusing on those of microscopic nature: the shape and structure of various types of cells (within plants and animals), viruses, bacteria, fungi (morphology, growth, and structure), vegetative and reproductive plant organs and tissues, selected human organs and tissues (structural features), as well as DNA structure and protein synthesis, among other topics. For some examples of the three-dimensional representations obtained to date, please see Figures 1 to 7 described below, which correspond to elements from two sets of our collection of tactile models obtained in this work. One of the best examples of an in-depth covering of a specific subject is our set of models for teaching plant biology. The first model of this set features characteristics of a selection of four common plants (e.g. lettuce, celery, carrots, and beans), highlighting the parts of those plants that are commonly used for human consumption (e.g. leaves, stems, roots, and seeds respectively), while showing them in the context of the whole plant. This model is meant to introduce students to plant biology. We also use them in conjunction with other models featuring the structural characteristics of plant organs, such as the model of a leaf (Figure 1), which helps teaching concepts related to photosynthesis, or the model of a seed (Figure 2), which helps teaching about the life cycle of a plant. 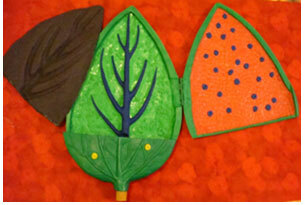 Both models show the characteristics of the different tissues that make up those plant organs and the learner can manipulate their parts to explore them individually. To assist teachers in further supporting in-depth knowledge of plant biology, we also built additional 3D and 2.5D models that show microscopic characteristics of the selected plant organs and tissues, as well as the morphology of their component cells. An example of such models is a representation of the leaf surface of Arabidopsis thaliana, a plant species widely used for the study of plant genetics. This model depicts the shape and distribution of leaf epidermal cells and stomata (Figure 3), so students can explore the cells’ features. 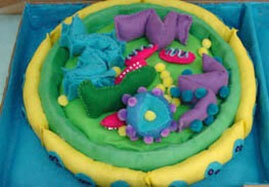 A final piece that can be used within this set is a model showing the organelles that make up a typical plant cell (Figure 4). The pieces of this model can be explored individually for their observation. 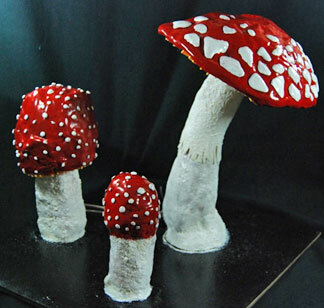 Another example is our set of three-dimensional models on fungal biology, made with the goal that the learner could explore the morphology of a number of fungal cells, such as yeast, spores, and hyphae, as well as learn the concepts of fungal growth and development. We then created a model showing the different stages involved in the formation of a fungal colony from a spore (Figure 5), like that of a common mold that grows on the surface of decayed food. The fungal biology set also deals with more complex concepts by including a model on how macroscopic fungi grow (Figure 6) and the characteristics of their internal structure (Figure 7). More recently, we have created a subsequent representation of the leaf surface of Arabidopsis thaliana, now as a 2.5D tactile graphic for use with the Tactile Talking Tablet developed by Touch Graphics, Inc. The model includes a file with auditory information describing the characteristics and function of the cells represented herein (e.g. epidermal cells and stomata). The benefits of multi-sensory learning have been recognized (Montessori, 1912; Shams & Seitz, 2008; Soler-Martí, 1999). Eschel (2007) posited that “the more senses you use, the better you will learn” (p.83). Adding auditory information to the models (touch response) aims to facilitate interpretation and promote autonomous learning by the student under the teacher’s guidance. These models serve as an example of the use of low-cost materials suitable for widespread use. Given the uniqueness of the models obtained to date, their particular application, and the fact there are no other materials of the same kind, most of our models have been patented. We currently hold 24 design and utility patents. The first curriculum we developed is oriented to facilitate teaching the general aspects of fungal biology and makes use of the set of 3D models on the same topic. This curriculum is presented as four modules containing activities to (a) locate fungi on a separate kingdom by comparing and contrasting fungi with plants and animals, (b) construct knowledge on fungal metabolism using yeast as an example of a microscopic fungi suitable for hands-on experiments and an activity to make bread dough, (c) learn about microscopic filamentous fungi growth (molds) and (d) understand how macroscopic fungi grow using activities based on clay or play dough modeling. Optional activities for some modules include serving yeast-raised bread or mushroom pizza. A detailed description of this curriculum will soon be released in a printed format in English, and it is currently available in Spanish and used by teachers and in teacher-training programs in Mexico. Curricula for plant biology topics has also been developed and tested which contain a complete sequence of proposed hands-on activities for visually impaired students that might include exploration of natural plants and 3D or 2.5D models, inquiry-oriented experimentation, and science learning-oriented activities. To date, we have successfully implemented biology workshops on fungal, plant, and cell biology in formal and informal settings for children with or without vision impairments. For many of our blind and visually impaired students in México, these workshops are their first opportunity to participate in experimental science activities and to experience (i.e. observe), through touch, structural features of biological objects and phenomena of microscopic nature. In addition, professional development courses for science teachers, special education teachers, or students of teacher-training programs are held on regular basis in México, contributing to the realization of inclusive science education in the near future. Products of the work presented here, tactile three-dimensional models and curricula to teach biology subjects, are aimed mainly to serve as a proposal to support the work of science educators at the elementary- and middle school-level, who encounter the challenge of making basic biology concepts accessible, attractive, and engaging for all learners. Models and curriculum target UDL principles with the prerogative of being inclusive for visually impaired students in a regular classroom. Unfortunately, to date, most models are not yet available other than through CINVESTAV. Nonetheless, additional efforts are being made in producing others. Because science can be learned in schools or in informal environments, such as museums, science fairs, outreach activities, and at home, most activities in the curriculum we have proposed use household and easily obtained science experimentation materials. Therefore, it is feasible for parents to use our curriculum activities to actively participate and encourage their children to pursue science learning. This work has been funded by grant SEB-CONACYT 86042 from Secretaría de Educación Básica (SEB) and Consejo Nacional de Ciencia y Tecnología (CONACYT) México and funds from the Consejo de Ciencia y Tecnología del Estado de Guanajuato (CONCYTEG) México. I thank and recognize the valuable input of all students and colleagues who have supported this work, particularly Noé Rico, David Treviño, Adriana Acosta, Arturo Chávez-Reyes, Verónica Di Bella, Daniel Elizarraraz, Isaías Hernández, Lourdes López, Tláhuac Mata, Brenda Segura and Leonor Valderrama. Thanks also to Adrián Lozano for his suggestions to this document. Ballesteros, S. (2008). Implicit and explicit memory effects in haptic perception. In M. Grunwald (Ed. ), Human haptic perception: Basics and applications (pp.183-198). Basel, Switzerland: Birkhäuser Verlag. Copolo, C. E., & Hounshell, P. B. (1995). Using three-dimensional models to teach molecular structures in high school chemistry. Journal of Science Education and Technology, 4(4), 295-305. Eshel, N. (2007). The science inside learning. Washington, DC: American Association for the Advancement of Science. Gabel, D., & Sherwood, R. (1980). The effect of student manipulation of molecular models on chemistry achievement according to Piagetian level. Journal of Research in Science Teaching, 17(1), 75-81. Gentner, D., & Steven, A. (Eds.). (1983). Mental models. Hillsdale, NJ: Lawrence Erlbaum Associates. Klatzky, R. L., & Lederman, S. J. (2002). The intelligent hand. In G. H. Bower (ed. ), The psychology of learning motivation (Vol. 21, pp.121-151). Watham, MA: Academic Press. Klatzky, R. L., Lederman, S. J., & Metzger, V. A. (1985). Identifying objects by touch: An “expert system.” Perception and Psychophysics, 37, 299-302. Lederman, S. J., Klatzy, R. L., Chataway, C., & Summers, C. D. (1990). Visual mediation and the haptic recognition of two-dimensional pictures of common objects. Perception and Psychophysics, 47(1), 54-64. Linn, M. (1972). An experiential science curriculum for the visually impaired. Exceptional Children, 39(1), 37-43. Loucks-Horsley, S., Kapitan, R., Carlson, M., Kuerbis, P., Clark, R., Melle, G., &Walton, E. (1990). Elementary school science for the '90s. Alexandria, VA: Association for Supervision and Curriculum Development. Malone, L., & De Lucchi, L. (1979). Life science for visually impaired students. Science and Children, 16(5), 29-31. Miner, D., Nieman, R., Swanson, A., & Woods, M. (Eds.). (2001). Teaching chemistry to students with disabilities: A manual for high school, colleges and graduate programs (4th ed.). Washington, DC: American Chemical Society, Committee on Chemists with Disabilities. Montessori, M. (1912). The Montessori method. New York: Frederick A. Stokes Company. Norman, K., Caseau, D., & Stefanich, G. P. (1998). Teaching students with disabilities in inclusive science classrooms. Science Education, 82, 127-146. Ramadas, J. (2009). Visual and spatial modes in science learning. International Journal of Science Education, 31(3), 301-318. Shams, L., & Seitz, A. R. (2008). Benefits of multisensory learning. Trends in Cognitive Sciences 12(11), 411-417. Soler-Martí, M. A. (1999). Didáctica Multisensorial de las Ciencias: Un nuevo método para alumnos ciegos, deficientes visuales y también sin problemas de visión [Multisensory Teaching of Science: A new method for blind, visually impaired and sighted students]. Barcelona, Spain: Paidós. Stefanich, G. (2001). On the Outside Looking In. In G, Stefanich (Ed. ), Teaching in inclusive classrooms, theory and foundations (pp. 1-21). Washington, DC: National Science Foundation. Theurel, A., Witt A., Claudet, P., Hatwell, Y., & Gentaz, E. (2013). Tactile picture recognition by early blind children: The effect of illustration technique. Journal of Experimental Psychology: Applied, 19(3), 233-240. Thier, H. (1971). Laboratory science for the visually handicapped elementary school children. New Outlook for the Blind, 65, 190-194. Treagust, D. (2007). Research-based innovative units for enhancing student cognitive outcomes and interest in science. In R. Pinto & D. Couso (Eds. ), Contributions from science education research (pp.11-26). Dordrecht, Holland: Springer. Wu, H. K., & Shah, P. (2004). Exploring visuospatial thinking in chemistry learning. Science Education, 88, 465-492. Figure 1. 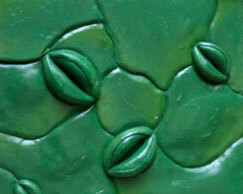 Tactile 3D model of a leaf, its structure and tissues. Figure 2. 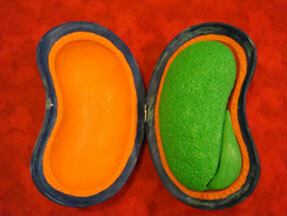 Tactile 3D model of a bean seed and its structure. Figure 3. Tactile 3D model of a leaf surface. Figure 4. Tactile 3D model of a plant cell made in fabric. Figure 5. Tactile 3D model showing the formation of a fungal colony and hyphal cell growth. Figure 6. 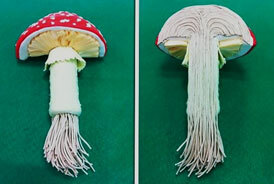 Tactile 3D model showing growth of macroscopic fungi. Figure 7. Tactile 3D model showing the internal structure of macroscopic fungi.